This post is brought to you by the letter R. Because it's full of random rambling and ridiculousness. If you happen to see my instagram feed... Well, let's just say that "feed" is an appropriate term. One of my goals for 2013 was to cook more, and I'm carrying that over to 2014! I've been on a "food that looks like other food" kick lately. And I've been pleasantly surprised by the results. I will most likely not be creating each recipe that I have pinned (there's close to 800 combined), but it's a lot of fun to try new recipes and taste new things. In OMNOMNOMNIVORE, DERP Tags food, instagram, random, when? huh? what? Wednesday! 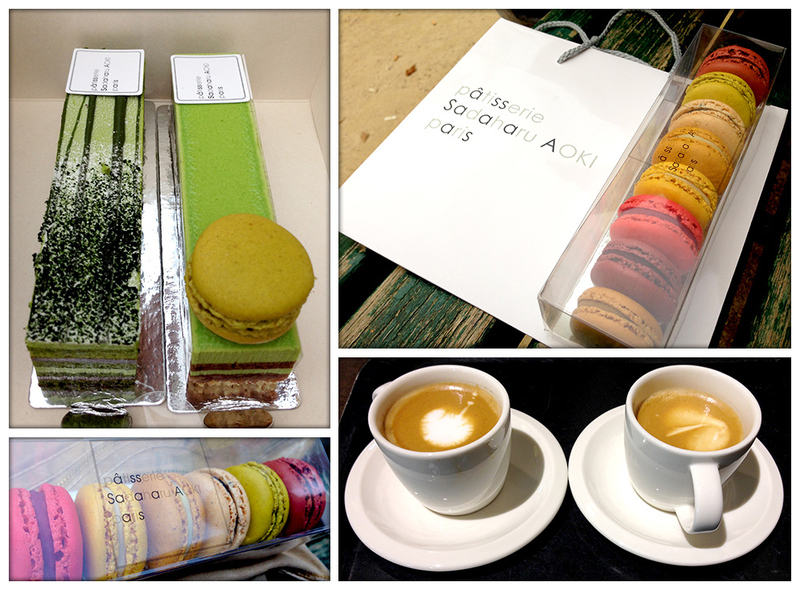 The following day led us to Sadaharu Aoki. We visited the boutique on rue de Vaugirard and it was magical. Pictured from top left: Bamboo which was a green tea flavor, and Matcha Azuki - Green tea and red bean with a petit macaron on top! Both extremely decadent yet amazingly light. And obviously, some macarons! I'm actually not fully on board the super macaron-hype train, but these were quite amazing. (Blasphemy, I know…) The few that I've tried here at home had been wayyyyy too sweet for my tastes, but these were perfect, delicately flavored, and melted in your mouth. Flavors from top to bottom: chocolat, matcha, sesame, citron, yuzu, framboise, cassis, coffee. The macaron itself was crisp on the outside and nice and chewy inside. The fillings were creamy but not overwhelming. The 2 coffees pictured are from Starbucks. That's right… We went to Starbucks. But these were actual macchiatos and not the Americanized version - just espresso with a splash of milk. Tiny and delicious. Travel tip: Cash only! We almost had to wash the dishes (not really…) but we just had enough for our two dishes, the appetizer and a bottle of wine. Safe to say the coffee addiction was cemented in Paris. We hit up the Louvre the next day and got a little pick-me-up in the form of this tiny espresso at the museum's cafe Comptoir du Louvre. The museum itself was astoundingly huge and breathtaking. Suffice it to say that we did not get to see even one third of the collections. Paris is a must-return destination if only for this reason. In any case, we didn't want to wander too much more after all the walking we did, so we wandered a few streets over to Le Stube to get some sandwiches to go. Not sure if it was because we didn't speak French, but when we first got there, the restaurant was full and we decided to get some food to go instead. But another couple came in after us and got seated after a table freed up. Eh… Not the best impression, but the savory foods were pretty delicious. We also got a slice of their lemon torte and German chocolate cake. Both were satisfactory, but not anything to write home about. Our last full day in Paris was probably the most relaxed. (And that doesn't exactly say much, because we didn't do anything strenuous except for walking around… :P) We visited Notre Dame and took some leisurely strolls around the parks. When hunger finally hit, we ended up at Loustic. It's a quaint and cute little cafe that serves brunch-y & breakfast-y foods and coffee. Pictured: Roast beef bagel, and vegetarian quiche. Our cappuccinos were also quite nice. They do seem to speak English here, so that's a plus. 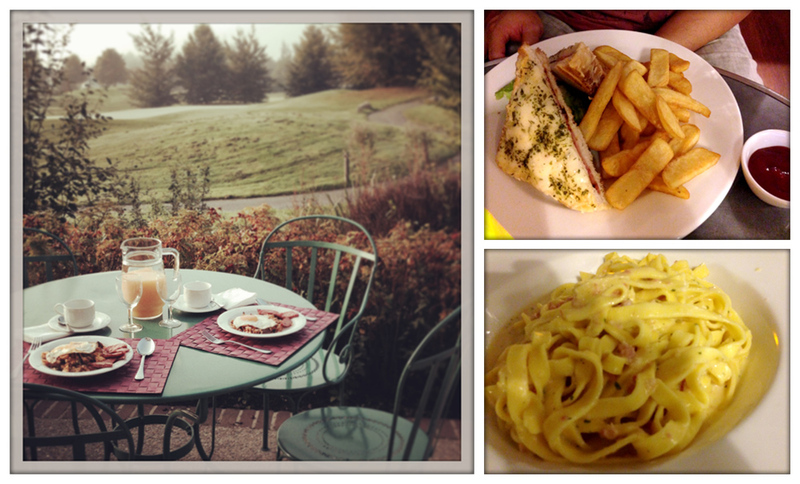 It's a fairly small venue, but the food and prices were decent and the ambiance is definitely nice and relaxed. 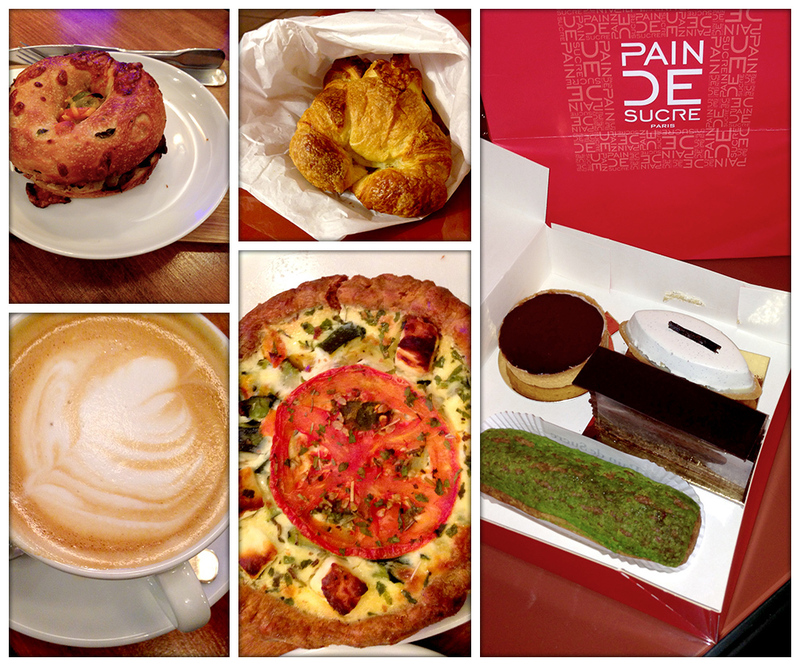 The patisserie of the day was Pain de Sucre. Be warned that when googling this, you should add the word "patisserie"… Otherwise, you might be linked to a swimwear website. Different kind of pastries, if you know what I mean… Anyway! My feeble iPhone pictures obviously can't do this justice. Paris pastries just can't be beat. Pain de Sucre is no exception. Mint Eclair - couldn't find a description for this on the website, but it's pretty self-explanatory. The pâte à choux was actually a bit savory, which was a great contrast to the vanilla cream, and the mint crust thing on top was amazing! With that said, this will be the highlight reel. We still enjoyed everything, and while we didn't feel that Paris had the best food, it was still good and tasty. Our flight got delayed quite a bit en route to Paris. We got to Marne-la-Vallée a lot later than we anticipated. I was pretty exhausted - traveling for about 24 hours will do that to you. So I wasn't exactly up to wandering around and stumbling through a new place. Luckily, there was a restaurant at the place we were staying at and a cute mini market with all the essentials. Dinner at the on-site restaurant Le Bistro was quiet and intimate. The bar area was cute with tiny chairs and tiny tables… But the portions were just right. I had the carbonara (traditional - of course) and the Mr. had the Croque-monsieur (grilled ham + cheese with béchamel sauce) Both were quite tasty. Afterwards we headed to the market for some breakfast stuff and my awesome husband cooked a quaint breakfast the next day. The simple eggs and sausage tasted quite lovely, and eating outside with that "French countryside" (read: golf course :P) view wasn't half bad either. The one thing we did make sure to do every day was to visit one new pastry shop. First stop: La Pâtisserie des Rêves (MAP). Before I continue, I have to admit something… I love great design. Branding and identity, packaging, simple typography, and an entire design suite dedicated to pastries? I've literally reached cloud 9. These 3 photos cannot possibly encompass how exquisite this shop was. The pastries were on display in an amazing contraption that consisted of pristine bell jars on a counterweight system with what looked like ventilation to keep the pastries at the right temperature. Oh man, I was trying so hard not to wig out, and therefore only ended up taking this one photo. But really, you just have to see it. I mean... It's just magical. Okay… Back to the pastries. We ended up ordering just one chocolate eclair as the language barrier was a bit higher than expected. We read some reviews that they did speak English, but perhaps we ended up talking to the only employee who did not get that memo. In any case, we didn't want to be *those people*, so we got our eclair and left. Look at that glorious piece of pastry art! It was damn amazing. I am not a fan of too-sweet desserts. I know that seems counter-intuitive, but too much sugar is not a pleasant experience for me. This had the perfect balance of chocolate and cocoa flavor. The actual pastry was not sweet, and in fact had a touch of salt, and the chocolate filling was ahhhmazing. Beautifully creamy, but not overwhelmingly heavy... Ahh, this post is making me sad and hungry all over again. We wandered a bit more and ended up in Montparnasse. After getting lost in little alleyways we made it to Crêperie Josselin (MAP). This place has some great reviews on Yelp, and with good reason. We ordered the Josselin (egg, ham, cheese, mushroom) and Bertine (egg, ham, cheese, onion) and both were quite delicious and not too heavy. The restaurant is small, but luckily for us our jet lag meant that we were eating at an odd time, so we got seated immediately. The kitchen is open to the dining room, and watching them prepare the food was as awesome as the smells wafting from the window. There was a plate on the counter with a giant slab of butter - my kind of place. The waitstaff were quite friendly and spoke English. There was also a cute older lady manning the griddles that greeted us warmly as we ended our meal and headed out the door. Travel tip: Crêperie Josselin only takes cash, so stock up on Euros. 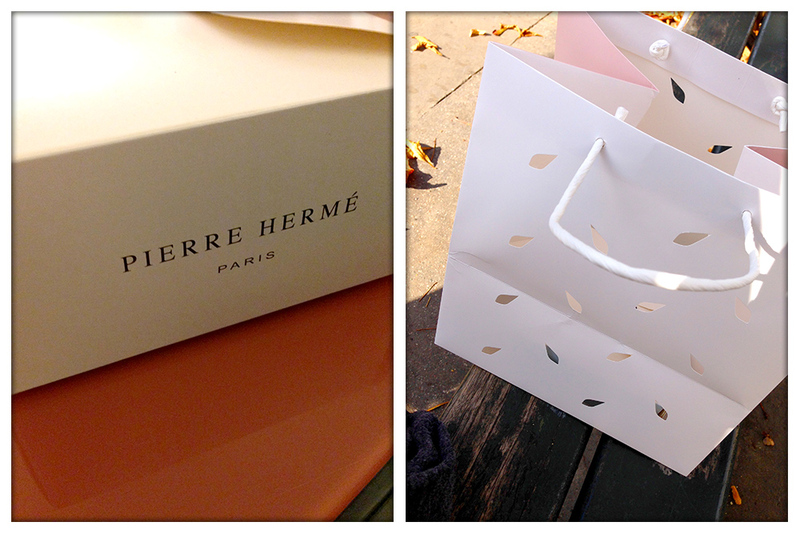 Pierre Hermé | The best bag I ever bought in Paris! The next day's pastry stop was Pierre Hermé (MAP). They have a few locations, but the one we visited is on Rue de Vaugirard. Travel tip: BYO fork! A little strange, yes… But there are tons of parks around Paris. Get your pastries in the morning and take a leisurely stroll, find a quiet bench and partake in the awesomeness that is Parisian baked goods. 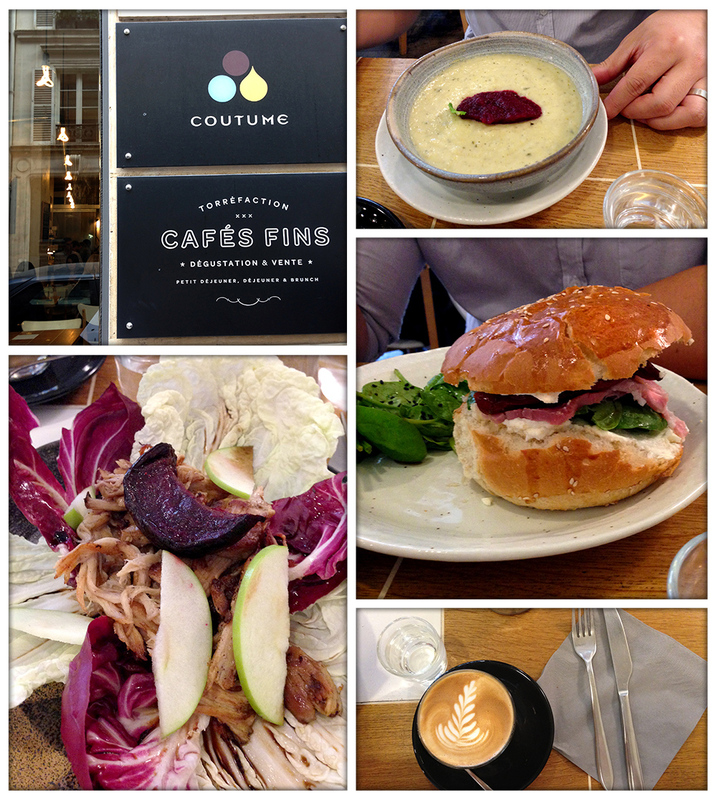 Lunch was at Coutume Café (MAP). We ordered a couple of lattes and they were very robust and flavorful. They specialize in roasting specialty coffees and it was definitely reflected in the quality of each cup. But while they are known for their drinks, the food was also quite exceptional. Pictured above (clockwise from top right) soup of the day (we think it was a broccoli and cheese soup with pickled beets on top), ham and cream cheese sandwich with pickled onions and spinach, latte, and roasted pork salad on a bed of cabbage with apples, beets and drizzled with balsamic. Overall great experience and would definitely go back again to try a few other dishes. There are a few more places I'd like to share, but I'll leave it at that for now. This post is a lot longer than I had anticipated. I guess I love food more than I thought. Good night! And see you guys in the next post.